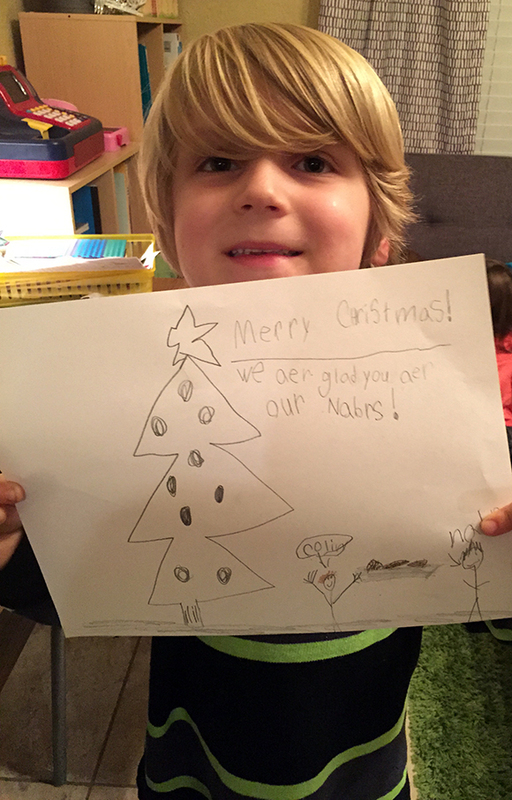 We’re in the midst of the Christmas season, and I’ve been trying to brainstorm about what to do for our neighbors. 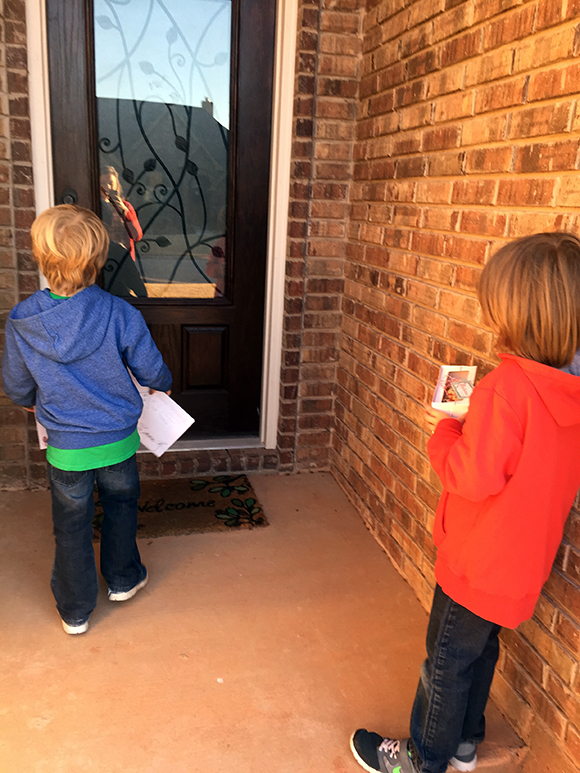 They’re great – always happy to keep an eye on our house when we go out of town, and just all-around good people. 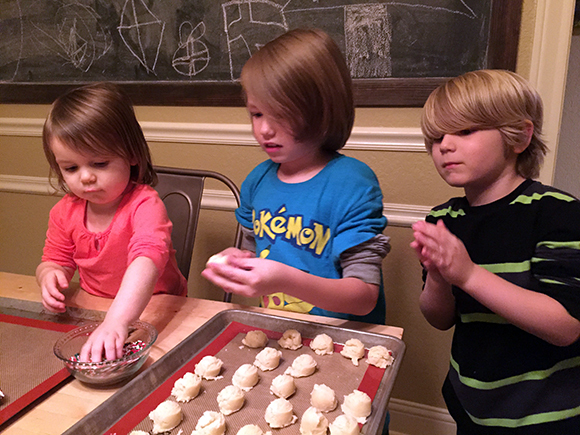 We decided it’d be fun to spread a little holiday cheer to them by making some cookies to surprise them with. 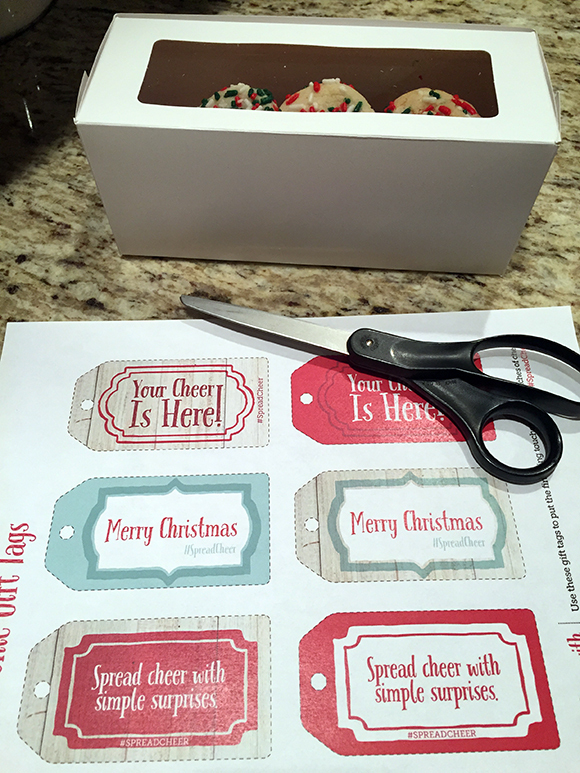 Betty Crocker inspired the idea with their free gift tags and info sheets about how to participate in continuing on with spreading the fun to others. It’s a busy time of year, though, and we knew there’d never be a perfect time to work on cookies. 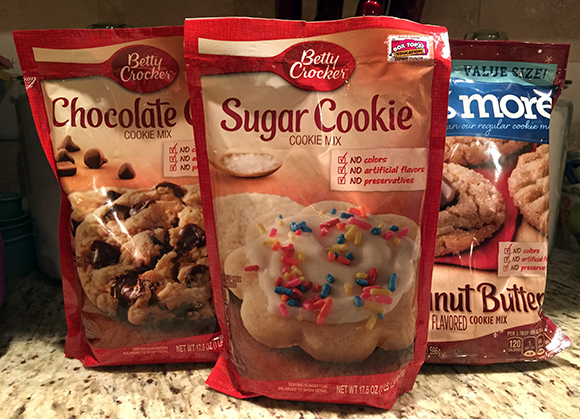 Then I remembered how quick & convenient the Betty Crocker cookie mixes are, so we knew we could make some great cookies even on a busy weeknight. We ran over to H-E-B to pick up the mixes and the few other things we’d need. 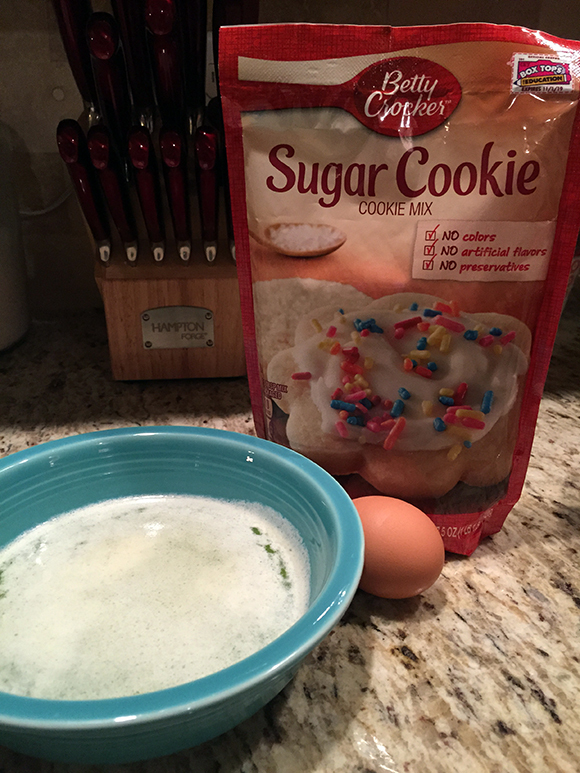 We decided to make sugar cookies, and besides the mix we only needed two other ingredients – a stick of butter (melted) and one egg. SO easy, and stuff we already had on hand in the fridge. We scooped out the cookies & ended up with 36. That’s a lot of cookies, perfect for multiple gifts! Then the kids took turns rolling the scoops into balls and then rolling those in red, white, and green sprinkles. 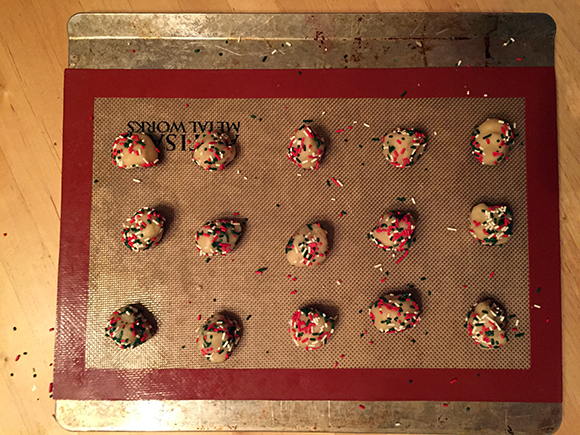 I’ll admit, I had to let go of my perfectionist tendencies when we were working on the cookies. 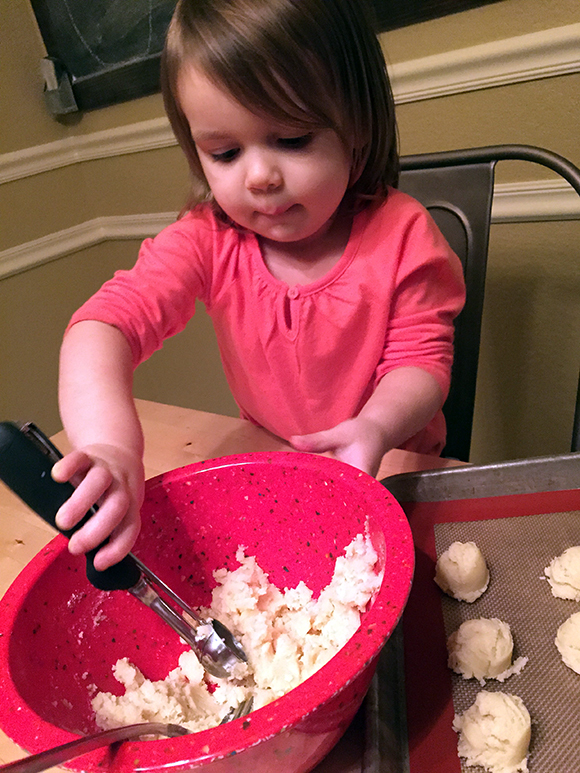 When you’re baking with kids, it’s never going to be a neat process, but the mess is part of the fun – so just enjoy the process! 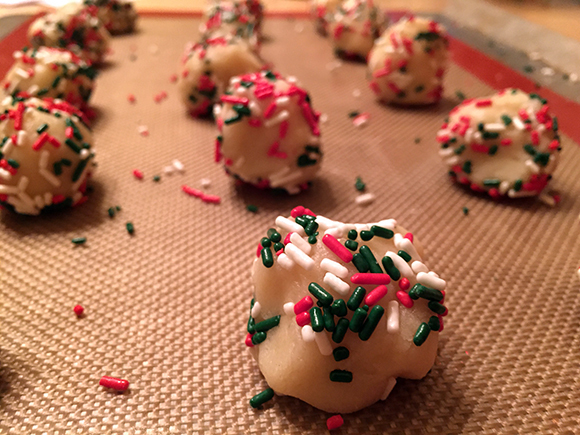 They turned out SO great – colorful and oh-so-Christmassy… and delicious, too (J admitted to me that he ate three this morning when he woke up, because he just couldn’t resist). 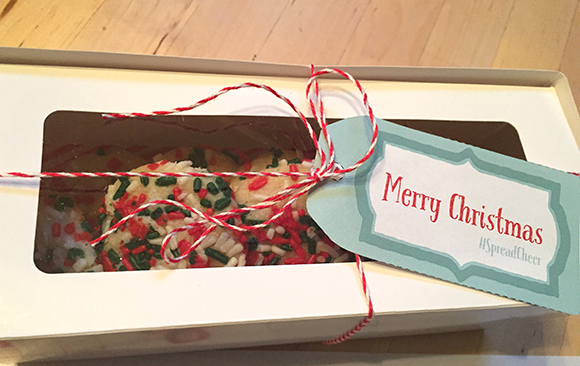 Once the cookies cooled, I put them in a little box, tied it up with red & white twine, and then added one of the free Betty Crocker #SpreadCheer tags. 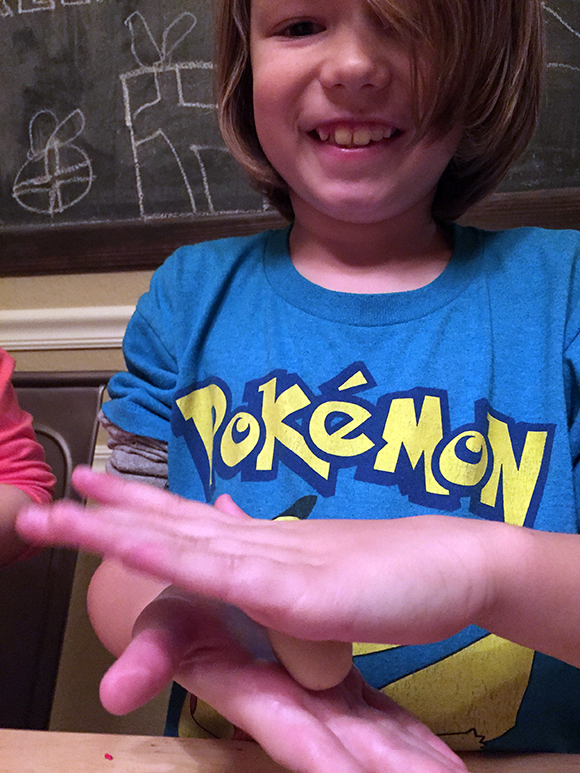 Again – so easy, and so cute! I love all the tags they have available in their free printable – aren’t they great? And then this morning before school we ran over to leave them on our neighbors’ porch for a fun surprise! I hope you’ll get in on the fun too! 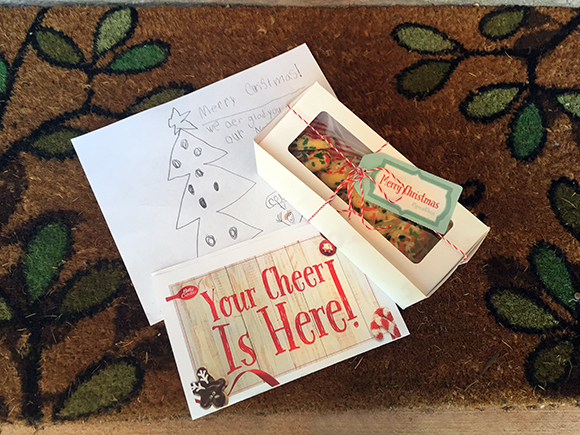 Make the world a better place this Christmas when you spread cheer with the gift of cookies! When you surprise your favorite people with fresh-baked goodness made straight from the heart, you’re letting them know that their good deeds don’t go unnoticed. Celebrate the season by spreading cheer with cookies, and help get the word out to inspire others to keep the celebration going. 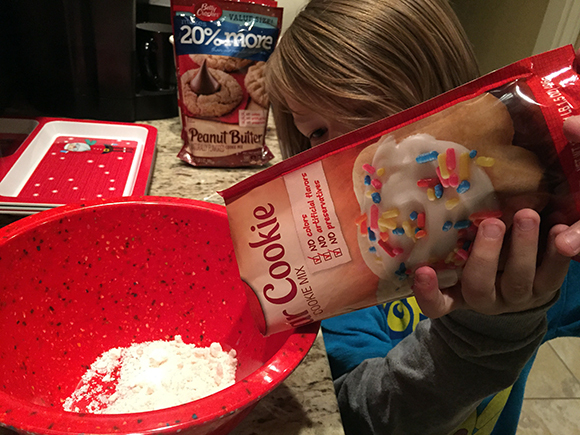 This Christmas, giving back is easier than ever with simple cookie recipes from Betty Crocker. And guess what? I’m hosting a giveaway for a $20 Target Gift Card so you can buy everything you need to spread cheer with your family! We love sugar cookies the most. I love to eat peanut butter cookies! I like to eat pizzelles at holiday time. I switch off between peanut butter and chocolate chip cookies. My favorite is oatmeal raisin cookies. 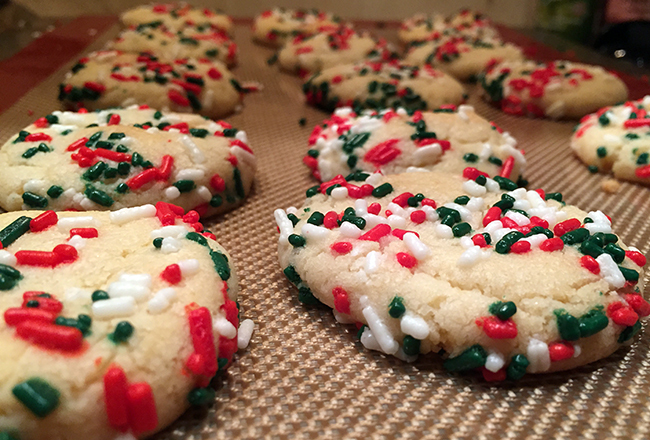 Our favorite type of cookie to make is the sugar cookie. My favorite cookies to eat and make are chocolate chip. Nothing beats a warm chocolate chip cookie. My favorite cookies are peanut butter cookies. Thanks for the giveaway! My favorite cookie is a seven layer cookie. My favorite type of cookie to both make and eat is oatmeal butterscotch cookies! I like peanut butter cookies best. My favorite cookie is the chocolate chip because you can make so many different varieties of them. I love adding different nuts and peanut butter. I love making chocolate chip cookies and eating them all up! Oh one of my favorites is the thumbprint cookies with a butter cream frosting in the middle! I like Chocolate Chip cookies and Sugar Cookies. I also like peanut butter cookies. My favorite cookie to make and to eat are decorated sugar cookies!! I love collecting cookie cutters, too! My favorite cookie to eat is oatmeal raisin. My favorite cookie to make is chocolate chip. My favorite type of cookie to make and eat is a frosted shortbread cookie. I love a good old fashioned chocolate chip cookie! I love eating sugar cookies. We love to make chocolate chip cookies! Lemon Cookies are my favorite to eat/make. Found a recipe that was delicious. My favorite cookies to eat and make are chocolate chip. I love the peanut butter cookies with the hersheys kiss in the middle. My favorite cookie to make and eat is Oatmeal Raisin.